Following his highly acclaimed award-winning debut album on Naïve, Bertrand Chamayou collaborates with one of Europe’s leading symphony orchestras, the Royal Scottish National Orchestra, to record solo and orchestral works by César Franck. 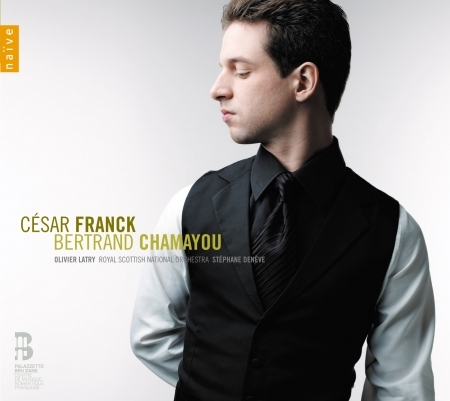 Fuelled by the desire to bring César Franck’s music out of obscurity, Bertrand Chamayou here demonstrates wonderfully why Franck’s music should be an essential element in the concerto repertory of a virtuoso pianist. The programme here features the four great works Franck wrote for the piano – each one, rarely recorded. Though ‘Prélude, choral et fugue’ and ‘Variations Symphoniques’ appear frequently in concert programmes, the other works recorded here are less well-known. ‘Prélude, aria et final’ is a genuine neglected masterpiece. “It is an example of the quintessence of Franck’s art, a virtually perfect work.” – Chamayou states in his booklet note. The scintillating symphonic poem, Les Dijnns, follows and can be said to clearly affirm Franck’s status as the direct successor of Liszt. The recording ends with ‘Prélude, fugue et variation’ – a work that possesses undeniable charm and melodic grace that has excited envy among pianists. Chamayou opts to perform the rare and delightful salon arrangement by the composer himself.